Designers of large public interactive displays (PIDs) should expect playful responses to these displays. This was the unexpected finding from a study by an inter-disciplinary group of designers and computer scientists at the University of Sydney. Public interactive displays have become widespread in urban spaces and are increasingly used in areas such as marketing, computing, engineering, and entertainment says Professor of Computer Science Judy Kay, who led the team that will present the study 's findings at the international Pervasive Displays Conference in Copenhagen this week. "The research team set out to learn how to design these displays for usability. When we began analysing the video recordings we were surprised at the very playful behaviour we saw. Even though they were in a very public space, some people spent time playing, dancing, shuffling and gesturing. So we carefully studied the videos of the people who spent the longest time," said Professor Kay. "Almost 75 per cent of our sample group demonstrated some sort of playful behaviour when operating our purposed-built interactive display. Dancing was a popular activity," she said. Built and designed by the University 's School of Information Technologies and the Faculty of Architecture, Design and Planning, the PID was located in the courtyard between the IT building and the Seymour Theatre. Over a ten day period, the system gathered data from over 1000 passers-by. "We developed an application that allowed passers-by to explore the information space using four simple gestures. To indicate its interactive capabilities, the display reflected passers-by as a mirror image in the form of a skeleton," said Professor Kay. "We chose an abstract representation of the user in the form of a skeleton, to give feedback to the user to help them learn to use the display. It adds some playfulness. "We operated the interactive display between 6pm and midnight, recording interactions that span from 30 seconds to several minutes. We then analysed the 40 longest recordings. "In our analysis, we identified three distinctive types of playful behaviour. 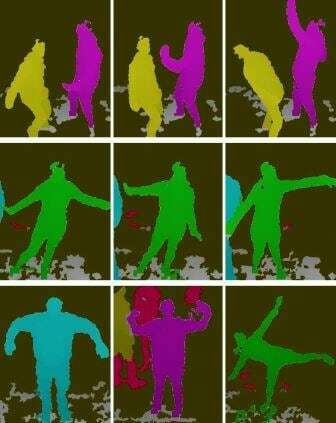 Dancing, what we termed locomotion and gesturing. For each of the recordings, we captured type of playful behaviour, number of people, and additional observation notes," stated Professor Kay. "Based on the findings, the team is recommending strategies on how an otherwise utilitarian information display can respond to playful behaviour," said Dr Martin Tomitsch, senior lecturer in the Faculty of Architecture, Design and Planning and lead on the interaction design. Dr Tomitsch said the study emphasises the need to understand the link between the design and the evaluation of new approaches to developing human-computer interaction. "We also identified a number of gestures such as waving and the 'exit pattern ' with people engaging in a playful interaction as they walk away from the display. This is useful information for consideration when designing public display applications. "The type and level of playful behaviour integrated into the design of PIDs could also be automatically adaptive to suit the demographic and objectives of passers-by," said Dr Tomitsch. The work was partially funded by the Smart Services Corporate Research Centre (CRC) as part of the Multi-Channel Content Delivery and Mobile Personalisation Project.